itsJUSTme: Women's Rights, where would we be today ? Women's Rights, where would we be today ? WHAT'S HAPPENING - I haven't written a regular blog post in such a long time I'm not sure I remember how. I have had so many book reviews to catch up on and then the Read-a-thon, and more book reviews. While the read-a-thon is fun to do, it is also very wearing on the body! It takes several days before I am up to speed again. The whole next day I can't even see straight, and can't sleep because I am so over tired. You may ask - Is it really worth it? - YES! It is such a sense of accomplishment. Last Wed. Ashley and I went to Seneca Falls to spend the day. First we went to breakfast at Jeremy's. Then walked up and down the sidewalks in town. We went to the Women's Rights Nat. Historical Park. Some of you may not know this but Seneca Falls is the site of the first woman's rights convention to discuss expanding the role of women in America in 1848. It is because of these meetings that women have the rights we have today, including the right to vote. This building is the actual site where the meeting took place. You can see the different bricks, the old brick is the actual brick from the old building. The wall behind me has water running over it, like a waterfall. On it is written "The Declaration of Sentiments"
As Ashley was reading this aloud, it brought tears to my eyes. I said to my daughter "Do realize what this means to women today? Just think what it would be like for us if none of this had never happened. And here we are at the very spot where the meetings took place! There are so many people, women, who will never get to see this first hand, and here we live just 1/2 hr away and can come here anytime we want. And what is even sadder is that there are women that don't even know about it or even care!" If you are ever in this part of NY please go see this very important part of our history, and please think it is a big deal, because it is! 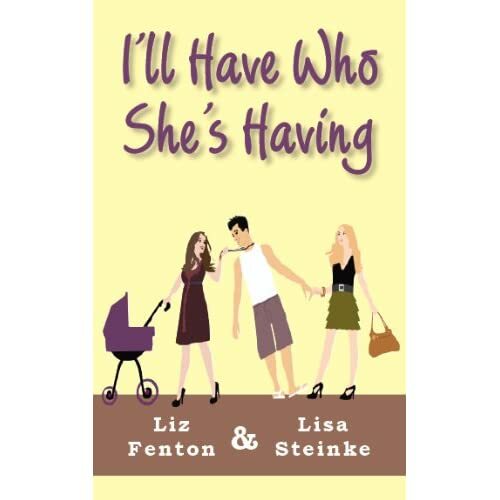 BOOKS - I had the great pleasure to finally read - "I'll Have Who She's Having" by Liz Fenton & Lisa Steinke. I have been wanting to read this book since it first came out. This is a very funny book! I give it 4 stars! It is about 2 sisters - Kelly, married and not so sure she is happy, and Kate, desperately seeking a boyfriend and husband. Kate is so set on getting the hot volleyball coach, Tim (who seems to have the hots for Kelly) that she can't see that there may be a better match right in front of her, Mark. By the time she finally realizes she may have made a mistake, it might be too late, the perfect man may have left for good. Will Kate ever get married? Will Kelly ever realize she has the perfect marriage after all? One of the things I really loved about this book is that the chapters switch back and forth between the sisters, each telling their point of view. And once in a while there is a chapter by one of the other characters - the liqueur store owner, Kelly's husband, Tim, Mark, and others. I loved these chapters best! Definitely a worth while read! Liz and Lisa also have a GREAT Blog - "Chick-Lit is not dead" Go visit and tell them I sent you! Lauren and I went to this when we were up there a couple of years ago wine tasting! We went in the morning on Saturday. I have to say when Lauren said "I really want to visit the Women's Rights site," I wasn't that thrilled. I am truly proud that I can say I was there and experienced the history of what happened. It was an amazing trip and I can't wait to take Emmah there some day. NY has a lot of history. A lot of people don't realize this. I always tell people some interesting sites to go to see when they are going to NY. Nice pictures of you guys. Wow. Thanks for sharing your amazing experience with us. I'll be looking for the book. I may have to buy a copy! What a meaningful experience with your daughter. You are so right..so many women don't know about it or care about it. Just the changes in the last 20 years have been amazing. We've come a long way baby...and there is still much progress to be made. FABULOUS POST!! wow that is awesome, if it wasn't so far I'd go. That is probably like a 6 hour drive right? Maybe one day when I'm visiting my son up in Geneseo, I'll hop over there, don't know how far it is from there either.